Just home from Jekyll Island…lovely long weekend. Weather in the mid 70s…sand, beach, sun, shopping and lots of photos! Will share soon. 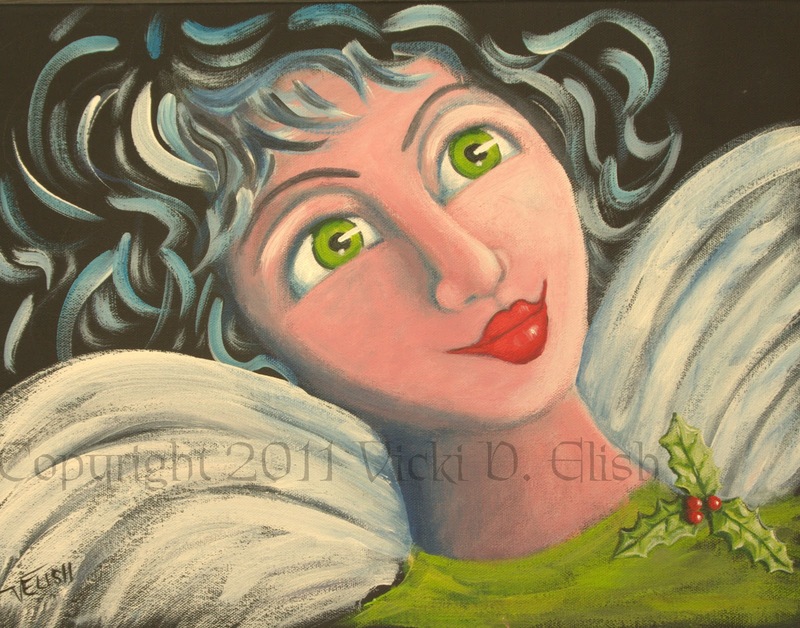 In the meantime, here is my latest in my series of angel paintings. Meet Noelle, a Christmas Angel. Noelle’s face ALWAYS reflects the wonder of Christmas! About Noelle: You might meet her in the check out line while Christmas shopping. She’s the one in line behind you who reminds you of the real meaning of Christmas…at the very instant that you are seriously thinking of punching that dreadful woman in the line in front of you. The one who snatched that Christmas red, cashmere, sweater from the sales rack, just as you reached for it! Ever so casually and with no apparent intrusion at all, the delightful woman behind you strikes up a conversation and somehow gently reminds you, without even saying it at all, that Christmas is about Jesus. It’s not about things you buy or the best gift to give. The best gift has already been given and it was free. You are already feeling better as you begin checking out. Finished, you turn to thank your delightful new friend and find that she is gone! She has disappeared—it is as if she had never been there at all! You shake your head in bewilderment and then with a smile on your face and real Christmas joy in your heart, you go along on your merry Christmas way! Need a Christmas Angel to save you from yourself as you shop this Christmas? Hope not! Have a Merry! Previous Post Finally! I’m Back…Hopefully to Stay! Hi, Vicki, so nice to meet another GA girl. You live in a pretty area up there in Cartersville. And your art is beautiful too. Thanks so much for stopping by to visit. Merry Christmas to you!